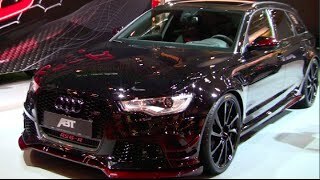 At the 2014 Geneva Motor Show, Audi unveiled its RS6 model in an all new avatar named; ABT Sportsline Audi RS6-R 2014. The credit for this goes to the car tuning company ABT which took the performance up high and matched the model to any super sports car present in automotive industry. Released as a limited edition of only 25 models worldwide, this tuned model is indeed an impeccable example of upscale engineering. 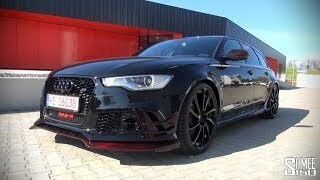 Let us have a look at the review of ABT Sportsline Audi RS6-R 2014 to know more about it. 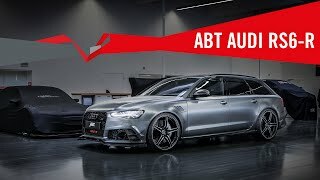 Primarily while creating this limited edition ABT Sportsline Audi RS6-R 2014 models, ABT used its power kit which includes ABT Engine Control Unit, specially designed software to give the power hike. This entire setup gets commendably complemented by the adapted stainless steel exhaust system which not only contributes to performance but also produces throbbing sound leaving behind an unmatched impression through its pair of smart dual ended pipes. The work didn’t just end here, while creating ABT Sportsline Audi RS6-R 2014, ABT also worked out a bit on other factors. The major contributors here are the Dunlop high-performance tyres and an adjustable spring kit. These amalgamations further get accompanied by 22-inch ABT DR alloy wheels and an aggressive body kit. The body kit we just mentioned includes parts made from exposed red carbon and surprisingly stunning fender inserts and rear spoiler. 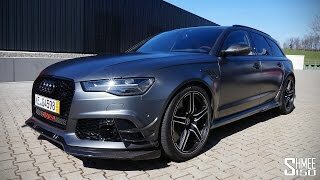 After its all tuning work, ABT Sportsline Audi RS6-R 2014 engine left behind its 500 hp and 700 nm cranking through 4.0 Liter V8 and produced robust 730 hp of total output and peak torque of 920 nm. 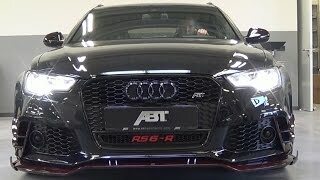 With these new output figures the top speed of ABT Sportsline Audi RS6-R 2014 touches mark of 198 mph.